We have created a small area as a sensory garden for our son, Joe who has dravet syndrome. We have used wind chimes and windmills, a colourful flag from a carboot sale and some streamers hanging from the trees. We also added a small water feature, a pump in a wooden barrel creates a pleasant rippling noise for Joe. A garden by definition is a place to excite and satisfy the senses each can be stimulated by using plants that not only look beautiful, but also feel and smell as such. With that in mind, I have made a list of some of my favourites that are fully hardy and will enhance any sensory garden planting scheme. There are a number of plants that have soft, velvety foliage. Stachys byzantia and Salvia argentia have woolly sliver leaves, known affectionately as “lambs ears”, these plants are purely tactile, but both adorn themselves with tall flower spikes during the summer. Phlomis fruticosa is a bit more conservative in its wooliness, but none the less is soft to the touch and has garish yellow flowers during the summer. In contrast, Miscanthus sinensis, is a graceful swaying grass, that bursts with silky flowers that rustle gently in the breeze. Plants have been used for thousands of years for their medicinal qualities, many as aromatics and thus add another dimension to the garden, as plants that can awake our sense of smell, an essential in a sensory garden. Monarda didyma, also known as Bergamot, has a heady aromatic scent, with the benefit of many heads of scarlet pompom flowers in the summer. Lavender, a sensory plant that is hardy and very common in gardens. Lavender has been long associated with relaxation and rest and the oil is harvested to add to a myriad of products. Helychrysum or Curry Plant has a distinct aroma of curry spice and has a burst of yellow flowers. With all aromatics and herbs, by rubbing the leaves and stalks between the fingers, the oils are released and the full power released. The extra dimension of taste can be provided by all fruits, vegetables and herbs, aromatics like Mints, Rosemary and Chives. Chives, are scented, easy to grow and can be used for cooking too. Some care should be taken with aromatic plants if your child has epilepsy. There have been incidences of ‘plant induced seizures’ particularly with rosemary. Something to bear in mind! In the next post I will show some photos of the physical and homemade sensory toys we have added to our our sensory garden. Many plants are used simply for their colour and abundance of flowers, however there are many plants that can provide a multi-sensory experience and thus can make a garden or even a small raised bed into a place of great enjoyment and learning. Stimulating the senses of sight, smell, sound and feel. Providing colour and texture to a garden with the added advantage of depth of fragrance and edibility. Day Lilly, a wondrous plant that produces long spikes with large beautiful flowers, that are edible and have a sweet taste, they look stunning in any garden as they are hardy and produce flowers for the entire summer. The seed pods rattle in the autumn. 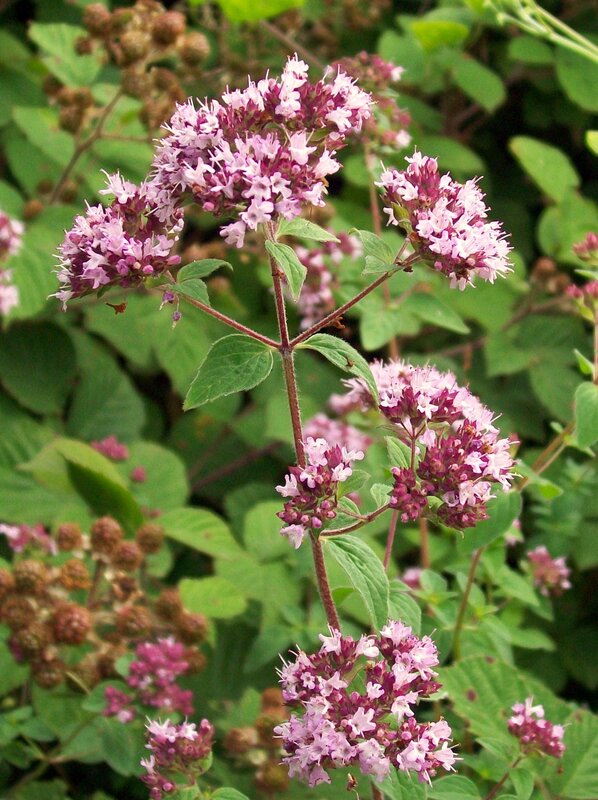 Oregano, a heavily scented edible herb, with an abundance of purple/pink flowers in summer. The leaves can be rubbed between the fingers to release the scent and can also be tasted and used in cookery. Thyme, another small aromatic herb, very hardy and has hard woody stems that can be broken to realise the scent. It is also tactile in the sense it is like a little shrub and can be patted and squeezed without much damage done. Chives are a member of the allium/onion family and have sprays of purple pompoms in the late spring, the leaves are highly scented especially when you squeeze them and can be eaten in handfuls. Rosemary, a highly aromatic herb and one that displays many purple flowers in late spring, larger shrubs can be shaken with care by the wooden stems with will rustle and release some of the scent. Nasturtiums, are easily grown from seed and will put on a flaming display of flowers throughout the summer; they are also aromatic and edible and can be cropped and eaten in the bucket load. Garden designer and restoration specalist. Having restored the formal garden at Sir John Mills old estate, I moved on to work in the design and restoration of historic and country gardens, with special interest in Cottage style, herbaceous borders and potagers, I now write a bit too. Please ask any questions on my blog about garden design and restoration in Kent and East Sussex. If you have any questions at all about choosing plants for a sensory garden please tweet me at @bloomsblogs or email me at the address on my website. My oldest daughter was born 12 weeks pre-mature and has Cerebral Palsy. 20 years on, she is a Junior in college, but as an infant, she had several sensory issues. She was a knee walker for many years, and would crawl across tar and gravel, but hated the feel of grass! A sensory garden like this would have been great for her. Hi Duncan: I am working on a sensory garden as part of Make a Wish Foundation for a little girl in Huntington Beach, CA USA. I am very interested in seeing more photos of your garden that you created for your son. She responds well to wind and movement. If you can email me some I would really appreciate it: CarterFClay@gmail.com. I am working on a grant for a sensory garden for our visually impaired campers. This gives me some additional information. Unfortunately, the grant application has to be in by midnight Oct 5 and I just received a reply to my letter of intent. I had some information and will add this to my list. Any additional info would be appreciated. am working on a grant for a sensory garden for our visually impaired campers. This gives me some additional information. Unfortunately, the grant application has to be in by midnight Oct 5 and I just received a reply to my letter of intent. i am Head gardener at Castle of mey we are doing a senses garden what plants should i use? smell: Helyocrysum and general aromatics like Monarda and Artemisia, as well as roses.